Victor Muller is a lawyer by trade, but that might be one of the main reasons why his Dutch supercar company Spyker is still around. Yet he’s also the designer of stunning cars such as the new C8 Preliator, and a guy who refers to himself as the ultimate customer of his own car. Here’s why that all makes perfect sense. Not long before Mike Ballaban had a crisis standing next to the much taller Dutchman, I sat down next to some decommissioned KLM plane seats to have a chat with him about never giving up on building cars that are just plain fantastic. He’s kind of like the James Glickenhaus of road cars. Spyker is set to merge with Portland-based electric plane company Volta Volare very soon, but the C8 Preliator had to come out before that so everybody could see how Spyker is back with a bang. Now, the headcount is down to 20, but since Spyker will only build 50 C8 coupés, that number doesn’t need to get much higher. According to Muller, selling cars has never been his problem. Funding always has. The lack of money in the bank was also the reason why he couldn’t turn his beloved Zagato project into a product back in the day. See, the fact that Spyker is back and making cars at all is a bit of a miracle. The marque dates way back to the 1800s, but Muller revived it in 1999. They spent about a decade making amazing cars, then briefly owned Saab from General Motors, but ran out of money and eventually filed for bankruptcy. Then last year, they mounted one hell of a comeback. What’s behind is behind. Either way, Spyker has won its (legal) battles and Victor says with the most loyal customers and “very friendly” investors behind his back, the company is here to stay to produce the most desirable cars in the world, be those V8-powered supercars or a fully electric four-door EVs. Spyker has built 267 cars since it started, and 70 percent of those are still with their first owners. You will find most of those über loyal customers in America, followed by Russia, England, China and the Middle East. Spyker’s production numbers will be kept low, mostly because Muller wants to sell cars fast at a high price. He markets them as collector’s items, and gives you no time to hesitate if you want one. By the time of the New York Auto Show, he sold 31 of the 50 new cars, proving that the C8 will be sold out before we know it. Twenty-nine of those were specified with manual gearboxes, as Spyker’s customers seem to be done with the automatics once and for all. Muller started to recognize the manuals’ importance when that rare stick shift Ferrari 599 sold for $700K at Pebble Beach. He hasn’t missed the show there since 1991. Michael Schumacher might have made F1-style automatics a thing, but Muller believes people will want to get the full control back, and looking at his version of a six-speed, he can certainly count on that. He also told me that since his Fiat 500 is Mallorca has the same flappy paddles, automatics couldn’t be further from feeling special. This, however, is something else. As for what engine will be connected to those exposed linkages, he has two answers. First, the Audi V8 will be gone soon. Future Spykers will get different V8s with a power output well north of the current 525 horses, because that’s great, but not sensational by today’s standards. Spyker is not in the business of making the fastest or most powerful car in the world. No Spyker buyer cares for that. 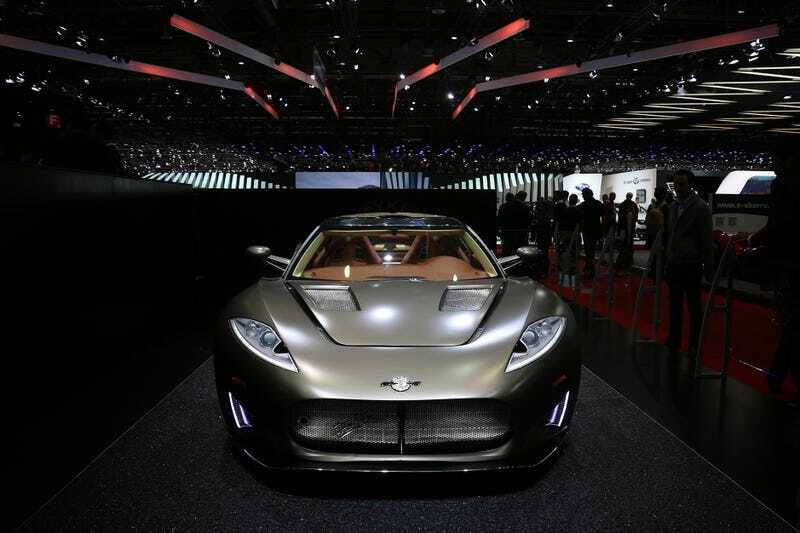 They are looking for style, elegance, and craftsmanship, and as long as their product can hit the obligated 200+mph mark, Spyker is done as far as the performance is concerned. They won’t build an electric supercar either. Muller says that a silent car with the comfort level of such a vehicle would bore him, and asks if he wouldn’t buy one, who would? Instead, Volta Volare’s EV technology will be used to make a four-door Spyker a reality, something Victor has been toying with since 2006, when they introduced the D12 show car at the Paris Motor Show. Spyker D12 Peking to Paris Concept, 2006. Spyker’s British manufacturing partner, Coventry Prototype Panels, was saved in 2012 by Envisage Group, and it now employs 250 people. It will take them about a year and a half to build 50 C8 Preliators, after which Spyker will move on to the Spyder version, with Muller’s eyes already focusing on a possible Zagato special edition. The guy just likes Zagatos, and who could blame him? My chat with Muller was done before the Prime Minister of Holland comes over to greet him. Apparently, once, they made them shut down the road leading from Abu Dhabi to Dubai so that he can drive a Spyker during his state visit flat out in the desert. Dutch pride and quite a lot of fun, that is.